An Edinburgh father is angry that parents of his sick son's classmates are blocking the only way he can take part in lessons. Keir Wallace suffers from a rare auto-inflammatory condition which means he often cannot leave his bed. His father John bought a learning robot which would take his place in the class and beam the lessons back to him. But despite reassurances on its security, his school is the only one in the world to ban use of the robot. The AV1 unit was designed for children who were in hospital for a long time and wanted to continue to attend school from their hospital bed. The patient at home has an app on their iPad where they control it completely. Mr Wallace was given the go-ahead to trial the robot at St John's RC School in Portobello in October 2017. But it has never made it inside the school. John told BBC Radio Scotland's Mornings with Laura Maxwell: "There are 850 of these in use around the world and this is the only school in the world where there has been a complaint. "A tiny minority of vocal parents complained. They said they never knew about the security of it. "But they have been given the facts. This thing is so secure - It has a 128-bit encrypted video stream that is impossible to crack. "But the parents don't believe that." The AV1 unit is the brainchild of Norwegian company No Isolation. The tele-presence robot is about 15in high and about 8in across. It can spin around 360 degrees so that it can take part in all types of class activities and it connects to the internet either via 4G or wifi. It operates behind the HTTPS protocol which online banking uses. Users can communicate via speakers with the teacher and even whisper to classmates sitting next to the robot. The user can switch a light on to indicate their hand is up to ask or answer a question. Another light shows that the child is there and listening but not feeling well enough to participate. There are more than 850 units in classrooms throughout the UK and Europe. The UK Department of Education earlier this year gave £4m of funding for AV1s to be in every hospital school in England and Wales. 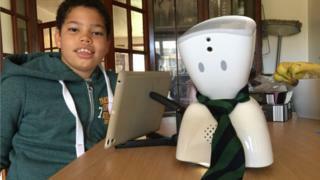 Of 400 pupils in the school, 11 families have objected to the robot's use. John says Keir now thinks the children at school hate him. And he believes Keir's rights are being abused under the 2010 Equality Act. He said: "This has to be highlighted, it is an abuse of a very sick child's right to education. "It is impossible to record the video stream, or take a screenshot of what's on the screen at home. "How sad is it that my kid missed up to 50% of his school for nearly two years. An 11-year-old can't go to school when the technology to allow that is sitting in my kitchen." Legal expert Andrew Tickell, from Glasgow Caledonian University, said it was an example of how modern technology challenges current legislation. He said: "On one hand you have the absolute right for reasonable adjustments on the part of this boy and you can understand why his father wants him to go to school and get the best education he can. "But on the other hand you have the substantial right to privacy and that was substantially beefed up by the 2018 legislation on data protection. "In terms of reasonable adjustments, interests and rights of others can be taken into account." A City of Edinburgh Council spokesman said: "We remain fully committed to trialling technology to help pupils access the curriculum so they feel fully included. An example is our teachers at the Royal Hospital for Sick Children who have used technology to help pupils access their lessons. "The proposed trial of the AV1 device has generated queries from parents about the technical aspects of such adaptations in the classroom environment. These include internet safety and data privacy impact assessments and we will continue our positive discussions with the manufacturer over its potential use in our schools."